Photo by Carnotzet from the Torontoist Flickr Pool. 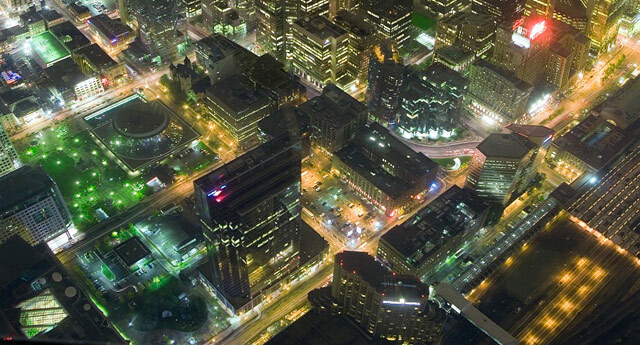 North American cities are undergoing a massive change. And it’s not just gentrification, Alan Ehrenhalt writes in The New Republic, it’s a wholesale “demographic inversion.” In Chicago, Atlanta, Washington, and elsewhere, the poor, minorities, and immigrants are being pushed to the outskirts while the affluent—and, in this context, overwhelmingly white—professional class colonizes the downtown core. The trend reverses the massive migration of the affluent out to suburban enclaves—or, more colloquially, White Flight—that defined urban life for much of the second half of the twentieth century. So what’s bringing them back to the core? Ehrenhalt argues that deindustrialization of the urban centre, and the subsequent decline in noise, grime, and crime, is a big reason. Another is the motivation to escape the long commute from the hinterlands to the central city (not to mention sky-rocketing gas prices). Most important, however, is the rise of a new generation of eager urbanists seeking to escape the “gated-ness” of suburban living and attracted to the vibrant downtown lifestyle. Of course, their arrival forces others—including some of the eclectic and artistic residents that made a neighbourhood attractive in the first place—to find cheaper digs. In the new city, that means moving further away from the centre. And so, Ehrenhalt tells us, immigrants and the urban poor are pushed to the geographic fringes to live “in suburban or exurban territory that, until a decade ago, was almost exclusively English-speaking, middle-class, and white.” Nevertheless, Ehrenhalt ends with the bright-eyed conclusion “that the demographic inversion ultimately will do more good than harm.” It’s too bad Ehrenhalt’s article neglects to use Toronto as an example, because our city is a case study of how this trend is no mere geographic reorganization; it is a stark example of growing economic polarization. That was the conclusion of a landmark study released last Christmas by the University of Toronto’s Centre for Urban and Community Studies. 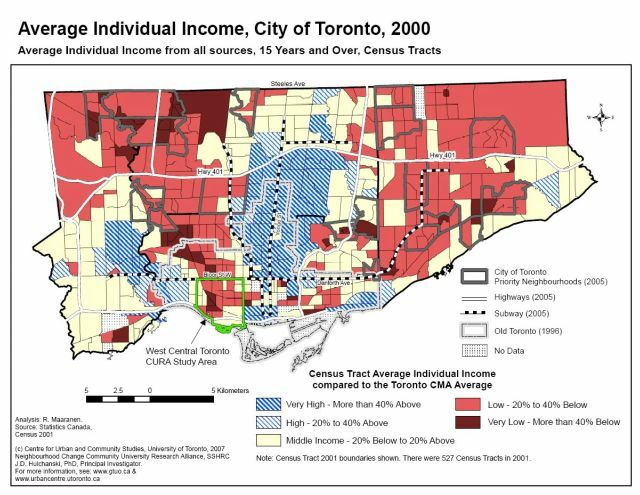 The Three Cities within Toronto: Income Polarization among Toronto neighbourhoods, 1970-2000 [PDF] uses thirty years of census data to chart a dramatic (and depressing) image of Toronto. In short, lead author Dr. David Hulchanski, director of the Centre for Urban and Community Studies, shows how Toronto has turned into three geographically distinct cities defined by income and socio-economic status. 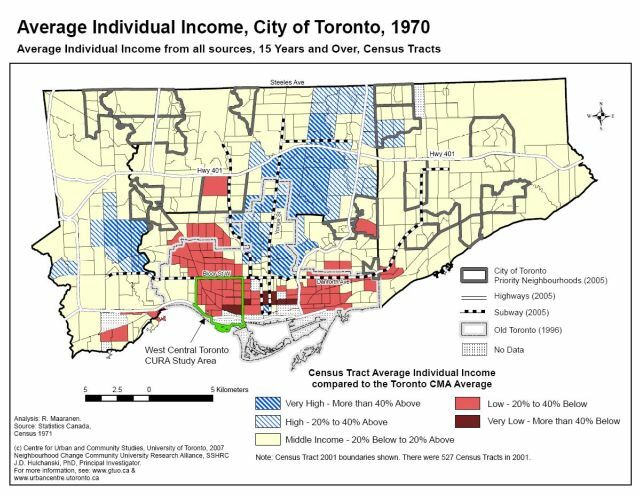 In 1970, 66 per cent of the city’s census tracts were considered “middle” income (defined as having incomes 20 per cent above or below the city average). By 2000, the proportion of middle-income areas shrank to 32 per cent of the city. On the other hand, the proportion of neighbourhoods with “low” incomes (incomes between 20 and 40 per cent below the city average) and “high” incomes (incomes more than 20 per cent above the city average) are increasing. Rather than a “city of neighbourhoods,” the report calls present-day Toronto a “city of disparities,” where the rich are getting richer, the poor are getting poorer, and the middle class is shrinking. Of course, the issue of economic disparity is overlaid with the complexities of ethnic diversity. The majority (84 per cent) in “high” income areas identify themselves as “white” and only 12 per cent in this area were born outside the country. In “middle” income areas, 67 per cent are white and 21 per cent are Black, Chinese, or South Asian. Of the total population in these areas, 48 per cent are immigrants. In contrast, 62 per cent of residents in “low” income areas were born outside the country. 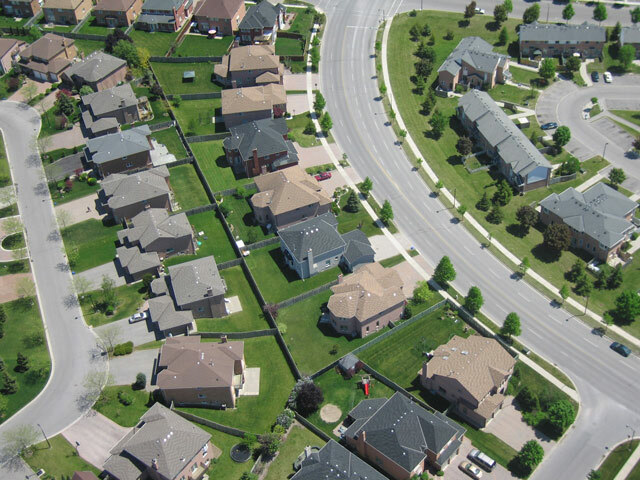 In these neighbourhoods, the population is 43 per cent Black, Chinese, or South Asian, and 40 per cent white. Plot this information on a map—as the Three Cities report has done (with lower income areas in shades of red and higher income areas in blue)—and you get the most evocative accompaniment possible to Ehrenhalt’s article. There have always been rich neighbourhoods and poorer neighbourhoods, as the above map shows, but the size and location of the two have fundamentally altered the shape of the city over the last thirty years. As the economic gap grows, the geographic distinctions become more pronounced, with poverty spreading northward and outward from the core towards Toronto’s inner suburbs (Scarborough, Rexdale, and the like). The only lower income sections within today’s downtown core are clustered around Chinatown, Regent Park, and St. James Town. Is there any clearer picture of the level to which the city is being polarized by income and ethno-cultural characteristics? Although this trend developed over the course of thirty years, it became pronounced, according to Dr. Hulchanski, with the cuts to social services in the 1990s. For this reason, the report argues that action from all levels of government can turn the economic and cultural segregation around. Income support programs, tax relief for lower income earners, and housing assistance would make housing affordable for everyone. “Inclusionary zoning” policies would promote mixed-income neighbourhoods and ensure that sky-rocketing rent doesn’t push lower income earners to the fringes. New immigrants also need to have the full opportunity to use their education and skills in fulfilling—and well-paying—jobs. 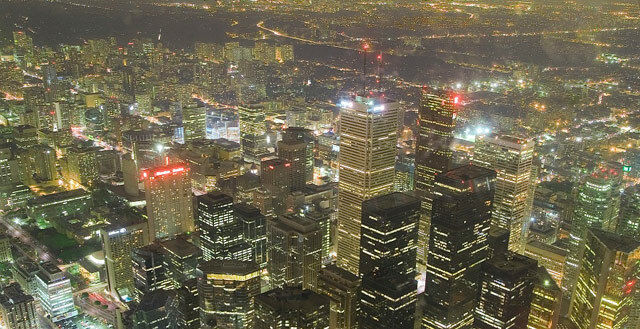 Writing in the Globe and Mail on December 22, 2007, Richard Florida was optimistic that—if Toronto is willing to address the problem head-on—there is a tremendous opportunity for the city to become a leader for the countless other cities undergoing this demographic inversion. Maps are from the University of Toronto’s Centre for Urban and Community Studies.